The railway’s attitude to signalling has changed a lot in the past few decades. In times gone by it was often regarded as something one unfortunately needed to run trains safely. On a modern metro railway it is now more positively seen as an enabler that helps maximise capacity. With the publication of an item on legacy signalling for the Programmes and Investment Committee and various other recent publications, it seems a good time to look at the London Underground Signalling strategy, and the digital railway revolution already quietly underway underground. We hear a lot these days about the ‘digital railway’ – which is often taken to mean automated trains. Network Rail and the Secretary of State for Transport miss few opportunities to tell the public that things will be better in future because we will have a digital railway. On Network Rail there is very little to show currently except for a few miles of Thameslink track – although to be fair, what they have got is quite impressive. Much less talked about is the fact that London Underground have had a digital railway on a number of lines for some time, are busy implementing it on four more lines and are planning to convert the remainder. We might be almost twenty years from a fully digital Underground railway, but there is a detailed plan to do so and much has already been implemented. The game-changer is undoubtedly Automatic Train Operation (ATO), where the driving of the train is automatic and, nowadays, driven by the signalling system which with an electronic ‘central mind’ that can oversee a route or part of it. Note that this is a considerable advancement on the original Victoria line system, which did little more than automate the existing concept of track speed limits and a restriction on getting too close to the train ahead. The technology associated with ATO has gone through various phases. In the late 20th century it was painful to do and sometimes technology was pushed beyond the limits of the day. The failed promise of 36tph on the Jubilee line by the end of 1999 showed for probably the first (and certainly not the last) time what happened when people relied too much on promises of technology that didn’t yet exist. The first decade of the 21st century saw what was achievable and the DLR and the Central line started to show how beneficial it could be once one succeeded in getting it working. In other words, the gains from success meant it was worth enduring a lot of pain, if need be, to get there. But it is only really now that there is a ‘can do’ attitude that isn’t over-optimistic. Sure, there will be problems – such as those Crossrail are battling in the Heathrow tunnels – but there are also clear successes. ATO using ETCS on Thameslink is a forgotten ‘good news’ story. It was installed on Thameslink and it worked with no discernible inconvenience to the travelling public. This revolution can be seen almost as a third generation of railway operating philosophy. Initially trains were separated by time. A train departed and the next one was not allowed to leave until 15 minutes had elapsed. Needless to say, this often didn’t end up well. The next generation saw trains restricted by space (‘block sections’) so that only one train was allowed to occupy a block at a time. Initially there was nothing physically to stop a driver entering a block section he shouldn’t. The only power the signaller had was to restrict a train to a particular route by means of the points. In an emergency, signallers had no capability of ordering a train to a stop within a block section and on lightly used, long distance routes these block sections could be many miles long. It is only now that the block working signalling concept is being overturned with either the elimination of block sections or, with some implementations, block sections so short that a train can occupy three or more of them at the same time – so crudely mimicking the effect of not being restrained by block sections at all. With traditional ‘block working’ a train driver can move his train unless explicitly prevented from doing so (typically by a red signal). Modern train working replaces this with a system where the train will only move when the ‘driver’ has approved it being in automatic mode and the train receives positive confirmation from the signalling system that it has permission to move. With a modern system, if that authority to move is rescinded, or not received for any reason, the train will immediately brake and then come to a stop. What allows this is the removal of the need for communications to be rigidly geographical. In the previous generation, authority for a driver to move could really only be rescinded by putting the next signal at red or, far less likely, by use of detonators. In either case, one had to wait until the train reached a location where the necessary message that the train needed to stop could be given. Train based, not track based? A recent paper presented to TfL’s Programmes and Investment Committee provided much of the details of what is planned and, by using this and other sources, it is now possible to get a fairly comprehensive overview of the future signalling that will be implemented on London Underground. Advances in technology have enabled traditional track based systems to be replaced with train based signalling systems. Now signalling engineers might have a lot of issues with that statement, but it is certainly true that a lot of signalling system equipment is now train based. There is still track-based equipment, indeed more so than before, but it is not so obvious. For example, there are no visible signals. In addition to trains and track, there is also a signalling centre, or multiple signalling centres, that do much more than just ensuring that trains don’t collide. A few years ago, the most you had on a train was a bit of equipment to detect an magnet in the middle of the track. If a permanent magnet was detected the system would be ‘armed’. If a second magnet of opposite polarity didn’t ‘disarm’ the system shortly later the system issued a warning to the driver and if he didn’t cancel it the brakes would be applied. The second magnet (the ‘disarming’ one) would be energised if the train was about to pass a signal that was green (‘all clear’). If the driver acknowledged the warning signal yet carried on regardless, there would be nothing physically prevent the train from continuing to move. Nowadays, with ATO, there is more on the train related to signalling. Initially there was uncertainty as to whether it was better for the train provider to provide the on-board equipment or whether it was down to the signal contractor. The current practice is for the train to be specified so it is ready to receive the signalling equipment (eg space for equipment, power supply, interface with motors and brakes). So, all the qualities of a good objective. Simple to describe, worthwhile, achievable. ‘Entire network’ would seem to leave no doubt that it really was intended to apply this to all Underground lines but, as it is, it does leave a little wriggle room to exclude Bakerloo services north of Queen’s Park if necessary. We can now break this down to a strategy for various lines in different time frames. Here again, the paper is helpful because it separates the Underground lines into various groups and describes the policy more specifically for them. We go a little further and look at individual lines where appropriate. During the upgrade, the existing systems are being maintained but not enhanced unless required to interface with new equipment. This is understandable, but inevitably signalling systems that are oldest (and therefore generally the least reliable) are the ones being resignalled, so there is the double whammy of an old system and upgrades only done when essential. Not surprisingly, this is reflected in the frequency of signal failures on the lines involved. 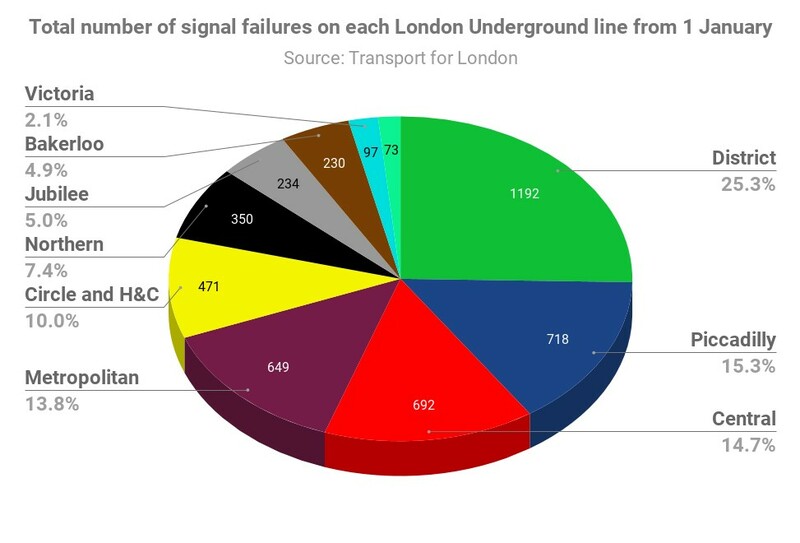 So, as reported via IanVisits, more than 25% of all signal failures, or more accurately, signalling system failures, occur on the District line. In fact, over 49% of failures occur on lines involved in the Four Lines Modernisation, despite it only accounting for 40% of route mileage and a couple of other lines also being quite problematic. Even if you take into account the lengths of the individual lines, things look no better for the District line other than being only the second worst line, but then the Waterloo & City does have a disproportionate number of signals and points for its length. Of course, a portion of this may be down to Network Rail, so London Underground may be unduly castigated. 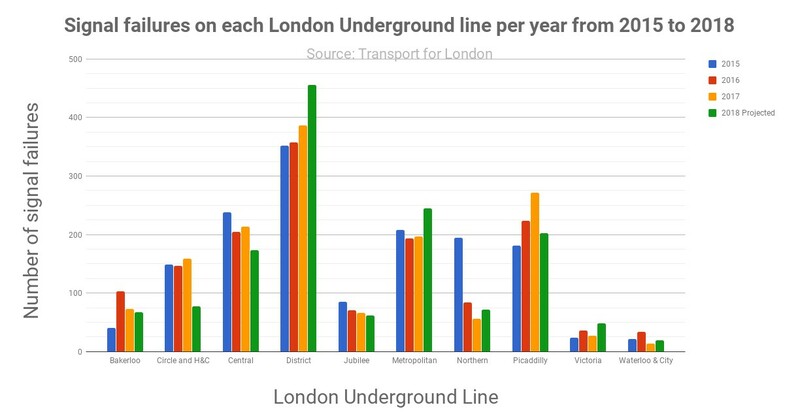 The fairly poor performance of the Bakerloo line is almost certainly due to failures north of Queen’s Park rather than anything under London Underground’s control. Of some concern must be the outer reaches of the Metropolitan line which were last comprehensively resignalled in the 1960s. This was as part of a scheme to electrify the line and provide quadrupled track as far as Moor Park. This is the final area that is due to be resignalled under the Four Lines Modernisation programme and it is not due to be completed until the end of 2021. This means that the signal engineers need to keep the existing signalling working for another three and a half years, yet there are reports that it is in a terrible state. This does not compromise safety, but it does impact reliability. The London Underground Railway Society’s (LURS) April 2018 magazine edition gave a good comprehensive update of this resignalling programme for the Circle, District, Hammersmith & City and Metropolitan lines. Since then the new combined control centre at Hammersmith has gone live, although it does not yet actually control any trains. The first section (Hammersmith – Latimer Road) is due to go live on 27th May 2018. In contrast to the Northern line, is appears that actual ‘switch on’ will take place without any closures being involved – though a lot of closures have taken place to run a complete skeleton service to ensure reliability of the system. This first short section will have the benefit of giving drivers an early experience of the system. It will be followed a month later on 24th June when ATO will be extended as far as Paddington (Circle and Hammersmith & City) station to complete phase 1. This combined migration area, for technical reasons, turned out to be the one that logically made sense to be brought into operation first. It was closest to the control centre at Hammersmith and it has the advantage of being a plain track section of railway with no junctions in normal use. There is the added complication of a terminus, but to offset this if it all goes horribly wrong at any time you have only disrupted a short section of the railway. Much more dramatic is phase 2, which extends ATO from Paddington to Euston Square. It will also include Finchley Road to Baker St on the Metropolitan line. So, this will control Praed St Junction, Edgware Road station (four through platforms two of which are used for terminating trains), two terminating platforms at Baker St and Baker St Junction. Phase 2 also requires every single S8 Metropolitan line train to be equipped for ATO, since virtually all Metropolitan line services either terminate at, or pass through, Baker St station. Such is the confidence in the signalling for Four Lines Modernisation that the date for phase 2 has already been decided. It is due to go live on 2nd September 2018. We will cover Four Lines Modernisation in more detail closer to this time. Indeed, the LURS article, goes as far as to suggest that the most challenging sections to implement involve those that have to interface to other systems (Chiltern Railway running on the Metropolitan and District line trains running over Network Rail tracks). A few years ago it would be the junctions around the Circle line which were generally regarded as the most challenging part of the implementation. The Victoria, Jubilee and Northern lines are in a category of their own. The title of obsolescence management highlights a very real concern of modern signalling systems. In the past there have been far too many cases of engineers desperately searching eBay to source replacement electronic components that are no longer manufactured. In general, the pace of progress is advancing so fast that equipment can be obsolescent in a few years after introduction and the equipment is hard to source. In most cases there is a more modern alternative available that is more reliable, but sometimes the existing system must be modified to accept the new component. When a signal failure can not only lead to thousands of hours of passenger delays, but also mean substantial lost revenue, it can often make sense to replace relatively modern equipment with the latest available. This will this reduce the likelihood of failure in future and, if a failure does occur, it may well simplify the procedure to replace the faulty component. A simple example of obsolescence management is the replacement of filament lamps with LED equivalents in signals. Not only is the replacement product better, but it is much more reliable and, because it is in demand for new schemes, it is unlikely to be difficult to source. A more relevant example is that on the Victoria line some of the non-safety-critical hardware consists of standard personal computers initially running Windows 7. The implementation team had their concerns about this choice but the argument in favour was that one would always be able to source a Windows-compatible PC and, hopefully, after testing, upgrade the bespoke software from Windows 7 to a later version. The Victoria line signalling is unique on London Underground. Supplied by Siemens, not Thales, it is generally well thought of. Night Tube has meant is has been upgraded since installation and there have been various tweaks for 36tph. More significantly, the Victoria line is probably about to undergo another significant signalling upgrade – this time to the depot at Northumberland Park. 5.3.2 The proposal is to replace the existing signalling system at the depot with a modern programmable system with a visual display unit replacing the existing shunter’s panel and modern train detection (replacing existing track circuits). The project will also co-locate control of the depot signalling with the Victoria line’s signalling and service control centre. What is strange is that, at one time, this was regarded as an essential requisite to enable the peak period working of 36tph on the Victoria line to be extended from a claimed 90 minutes (it is actually about 80 minutes) to three hours. The problem is simply one of getting all the trains into service by around 0700. No further asset changes are necessary to support introduction of the full three hour peak service from June 2018. It is therefore surprising that no mention has been made of this in the Update on Major Projects – especially as a planned similar extension to peak working on the Jubilee line (due to start on 20th May) is mentioned. There are no known significant signalling upgrades due on the Jubilee line. As the order for new trains was cancelled (or ‘paused’ in TfL parlance) there would appear to be no necessity to do so. It would appear that the necessary capacity and flexibility is already available for any changes that may take place. Indeed the new May timetable sees an improved service to Stratford (24tph all day, up from 22.5tph peak and 18tph off-peak) which is largely achieved by introducing stepping-back at Stratford and terminating some trains at the recently relaid and improved turnback at West Hampstead. No signalling changes were involved. The Sub-surface lines, being resignalled under Four Lines Modernisation, may appear to be where all the action is at. A lot is happening on the signalling for the Northern line, however. This is because of signalling that will be installed on the Northern line extension to Battersea for which the contract was recently signed. The Northern line is currently signalled with the TBTC (Transmission Based Train Control) system made by Thales. It therefore comes as no surprise that Thales will signal the line from Kennington to Battersea Power Station. Although the extension is not particularly long and, Kennington excluded, fairly straightforward, for various reasons it was decided that it merited a new Vehicle Control Centre. A Vehicle Control Centre is the ‘brains’ behind the system, but it is impractical to have just one for the whole line. Currently the Northern line has eight VCCs and each one controls a specific section of the line. What is highly relevant to the signalling strategy is that the existing TBTC system is already obsolescent. In simple terms it is generation 2 (2G) whereas the line to Battersea Power Station will be 3G. This does mean there will be the issue of interfacing 2G VCCs with the 3G VCC. But it does also mean that signal engineers will become familiar with 3G on the Northern line and, when the time comes to upgrade one of the existing VCC areas, then there should not be the problem of staff not being familiar with the latest equipment. With a lot of the cost of TBTC in the software and in the track loops (and associated equipment) throughout the length of the line, replacement of the VCCs over time will probably be cost effective. A planned replacement programme will also probably avoid a situation where the line becomes a hostage to unavailable spare parts. 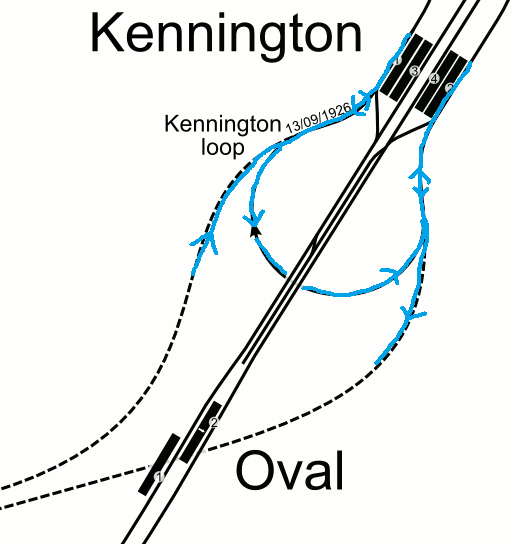 As part of the signalling work to be done, the Kennington loop will be made bi-directional. This was already being considered but the ‘pausing’ of the additional trains probably made this even more desirable, as the latest plan appears to be to stable just two trains at Battersea overnight. Trains would arrive at platform 1 at Kennington from Battersea then reverse around the loop to platform 2 before reversing again to return to Battersea. Making the Kennington loop bi-directional makes it possible to run an early morning or late night shuttle on the branch should that be considered desirable. It would also mean that, if the Charing Cross branch were to be closed for any reason, a service could be maintained to Nine Elms and Battersea Power Station. A further outstanding signalling upgrade would enable 32tph to run between Morden and Kennington. This was originally due to be implemented in December 2014 but was postponed. It was excluded from the work that was recently ‘paused’ and assurances were made that this would still happen. In a sense it is the most important upgrade on the Northern line as it would provide more trains to the most crowded section of the line. It was originally delayed by the need to give priority to signalling modifications to cater for Night Tube. It is not now due until September 2019 (until recently it was April 2019) and one wonders whether signalling of the Battersea Power Station branch and a consequent lack of signalling resources is the cause of the latest delay. Finally we come to the lines that are due to be resignalled under the Deep Tube Upgrade Programme (DTUP). The upgrades for these lines are still a long way in the future. For this we need to look at each line individually. In its simplest form, life extension involves replacing components before they fail. As mentioned, ideally this is not like-for-like but with modern equivalents. You avoid the need for redesign and the upgrade can be piecemeal. What is more, upgrades to legacy signalling systems do not involve alterations to the trains or pushing the limits of technology. The principle of Life Extension have been applied very successfully by Network Rail. When they discovered that 40% of all delays they were responsible for on Southeastern were down to signalling and track failures between London Bridge and Lewisham, a policy of replacing life-expired equipment along that section reduced delays dramatically. Basically, you change components when the risk of it failing is no longer worth taking even though it probably will work reliably for many years to come. The recent order for new Piccadilly line trains does not include a signalling upgrade and it is made quite clear that the initial tranche of trains is expected to be able to upgrade the frequency from 24tph to 27tph under existing signalling. This is, presumably, achieved by better acceleration rates and reduced dwell time. This means that the existing signalling has to last at least until 2026, and probably a few years beyond. On the Piccadilly line it is not the signalling itself which is the main problem. The signalling is old, but is of proven design. Also, presumably, once the Four Lines Modernisation is complete, there will be a glut of spares. In many cases, these can be refurbished and effectively be as good as new. The existing Piccadilly line signalling and control system is vulnerable to failure. The frequency and impact of failure is predicted to increase rapidly as asset degradation and obsolescence are exacerbated by diminishing spares and technical expertise. Assets and building conditions at the service control centre, LU’s oldest serving, date from the 1950s and offer sub-standard working conditions. Full Programme and Project Authority is already in place for the design and implementation of a new control system. This project, the Piccadilly Line Interim Control Upgrade (PICU) project is now fairly advanced, with fit out of a new service control building taking place and the control system nearing go-live for the first section. The project appraisal delivered a benefits cost ratio of 11.5:1. The project is well underway. It is an excellent illustration of how London Underground have encountered the worst of all worlds. The aim was for an earlier line upgrade, which should have happened by now. When that didn’t happen the decision was eventually taken to replace the service control side of things, despite the fact that now a lot of the work may see only a few years use. A side-effect may be that it will be more difficult to justify a further replacement in the near future as the benefits will not be as great. Replacement of obsolete and high risk equipment including transferring software to an up-to-date programming language and replacement of depot control panel. The reference is surprising because it would appear to refer to the ancient control system which, as a post on District Dave pointed out, has been put out to tender for maintenance. It could be that the tender was just London Underground examining all possibilities or, maybe, the lack of positive response means that an alternative is being considered. This lack of planned signalling updates until future replacement is understandable. North of Queen’s Park, Network Rail is currently responsible for the assets except at the depot. South of Queen’s Park there is not much complexity involved. There is a small depot at London Road near Elephant & Castle for which there is a crossover north of Lambeth north and a single line junction on the northbound running line. There is also a trailing crossover at Piccadilly Circus which is not in normal use. There is also a trailing crossover west of Paddington which is also rarely used. Apart from that it is a simple stretch of plain line between Queen’s Park and Elephant & Castle in a warm and dry tunnel. Nor is the service level of 22tph especially challenging to run with the current signalling. The Central line has its own ATO system. While it appears to work well, no-one would design such a system today. For instance, the Central line is the last line to have a train describer system installed to keep track of the trains. Whilst it does interface to the signalling and is itself digital and does appear to be reliable, it is a completely unnecessary layer of complexity. Nowadays, the train describer functionality is built into the command functionality of the signalling system. The existing Central line signalling and signalling control system was installed in the late 1990s and many sub-assets and components are now obsolete. This is mainly due to the age of the electronic components. Repairs to existing components are becoming increasingly difficult due to the availability of compatible spares and the assets present an increasing risk of major service affecting failures. Siemens Rail Automation (the Original Equipment Manufacturer) will carry out the works, on the basis that they are the only supplier who can modify and assure the system the[y] installed. A completion date of 2025 is indicated. Last and least is the Waterloo & City line. In the Deep Tube Upgrade Programme it is currently in fourth and last place, having at various time been considered for positions one, two and three. The line has always had the problem that it is harder to make a case for the Deep Tube Upgrade. The passenger flow is almost entirely one way in peak hours and very light outside of them, and to do the job properly would involve a lot of costly work to the underground (small ‘u’) depot. In the paper on signalling, the Waterloo & City gets just one mention and that is only that the signalling will be replaced as part of DTUP. This is understandable. The signalling was replaced (on a like-for-like basis) when the line was upgraded a few years ago. Nevertheless, it is slightly concerning that by the end of 2018 the two-station Waterloo & City line is expected to have had almost as many signal failures from the 1st January 2015 (73) as the sixteen-station high-frequency Victoria line (97). It is clear that LU sees the massive benefit in modern signalling and what it can achieve. It is also clear that they have been quietly working towards their own ‘digital railway’ on the ground for some time. Yet, equally clearly, they are aware it is expensive to do so. For TfL it will be challenging to fund future schemes with finances the way they are. The big issues for the organisation are how to get value for money on the lines that are not automated, but will be one day, and how to continue to get money and ensure long-term reliability on the lines that already are automated. Thanks to Jonathan Roberts and ngh for their assistance. Utterly shocking to hear that the Victoria line signalling is part-reliant on Windows. LU should have insisted on open source operating systems such as Linux throughout. Because of the financial and technical risk of relying on software supported by a single vendor on a system that will be used for decades. What about the financial and technical risk of an operating system that is not support by a single vendor but reliant on an informal arrangement and has splintered into numerous variants? And might not be around in 20 years time in its current form. Windows will be around in some recognisable form and if there is a future problem there will be a huge financial incentive for those in charge to sort it out – if it is Linux then it is no-one’s problem. It also has a huge installed base elsewhere of companies (and governments) relying on it. It will not go away. LU had to make a commercial decision and that commercial decision was to go for Windows. Supporting linux is considerably more expensive than windows, there is simply less experianced support staff available for it. I can get 100 high quality windows engineers in minutes, I would be lucky to find a single person for linux. Given the choice in large computer projects we would rather pay for windows than get any linux flavour for free, in the long run it pays for its-self many times over. Thanks Steve for more authoritatively describing the reality than I can and adding a good practical reason which makes the decision appear to be a reasonable one to make. This isn’t really the place for a detailed discussion of the merits of Windows v Linux in a critical environment so further comments on this will be deleted. Let’s say that in 1996 you bought some kind of machinery which was controlled by a new Windows 95 PC. The OS calls that the control software would have used were supported until Windows XP  and deprecated in Windows Vista . Microsoft stopped selling Windows XP licenses in 2014 and ceased support at the same time. Similarly if you went the Apple route, you would find that replacement computer hardware ended with the demise of PowerPC Macs around 2007-8 and the cessation of support for classic mode under MacOSX 10.5 in 2009. The chances of getting the original manufacturer to rewrite the control software at this point — even if they are still in business — are slim, and would be at a significant cost in both time and money (months, £100k+ for something fairly simple, more for stuff that’s more complex). If your control system was purchased around a PC running BSD — which would have been the go-to open source OS in the mid-’90s — then you would be able to replace the control PC with commodity off-the-shelf hardware and still run your control application. If you were a small business with no in-house expertise then you might need to fork out for a couple of days’ consultancy to ensure the PC/OS was set up correctly to support the control application. This might cost you a week and £2-3k. @PoP: Sorry to continue on this note, but I’d like to know where STEVE’s magic tree of windows engineers is. We have great difficulty in getting the right skills! @PoP Linux/Unix based systems are also used by multiple government and commercial organistations, including of course Network Rail for several mission-critical systems e.g. signal control. If you’re going to be installing a system that is meant to last for decades then far better to use open software and standards that can adapt to changing technical realities, e.g. new hardware. I would humbly suggest that TfL have probably done their homework on what Operating System they use in different circumstances. Hell, if people really care that much I may actually do a piece on it. To reiterate POP’s comments though this isn’t the place for a big Linux vs Windows debate. Future comments will just be deleted. 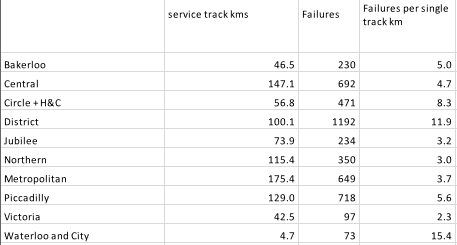 I’m a bit confused about track km and failures being allocated to specific lines in the failure statistics, in particular on the subsurface network, Just checking one line, the majority of the track exclusively used by H&C/Circle is between Baker Street and Hammersmith, under 8 route km, so approx 16 track km, yet the figure in the table is 56km. I’m worried there may be some double counting of track km and failures on common sections shared with District/ Metropolitan. Not saying it invalidates the analysis in any significant way. 1. Where’s the eastern boundary for 4LM phase 3? I would guess “just beyond Whitechapel”? 2. What will the Z1 service pattern look like once Stratford Jubilee gets more terminators? 24tph Stratford+6tph North Greenwich? The dates for the 4LM migration areas seem very optimistic. We reckon we will still be in full control at Baker Street into next year. Final point……the first digital railway with ATO and continuous ATP with automated central control was the Victoria line in 1967. There was no software, there were no microprocessors or computers of any kind. The automation relied on electromechanical machines and I suppose the only firmware was the punched paper rolls for the programme machines! Historically, one trusted the driver to do the right thing. In the future we’ll be trusting the computer instead. Several major IT firms supply emulation software to allow you to use new hardware but the original operating sytem and software which is what most banks and defence contractors to enable them to keep running software for several decades. Hence as long as you chose an operating system which will have emulation support (Windows / Unix family / IBM 360 family etc ) there is no issue. Not a linux v Windows comment but an obsolescence one. It was the case that the northern end of the Picc was running on a PC based system – known as “Metal Micky” – used Windows 3.1 – an industrialised version I think. The long asset lives of signalling really don’t work well with PC hardware and software cycles. I am waiting for the day when some signalling functions are carried out on a Raspberry Pi – possibly with a Windows emulator. 1. Pretty sure the boundary is Stepney Green. Except for one boundary on the Metropolitan line, they are all at stations to avoid trains unnecessarily coming to a halt. Diagram is in this document. 2. Correct. Basically in the peaks, 1 in 5 trains terminates at North Greenwich. Working Timetable here. Please remove my comment of 14 May 2018 at 12:28 entirety. In its snipped state it doesn’t add anything to the discussion. Apologies for posting it at all in the first place but in my defence I’d started typing before the moderator’s note appeared and I only saw it after I posted and saw the refreshed page. I am fairly sure there is double-counting but this would make sense because you are measuring delays across the different lines. So a failure at Great Portland Street, for example, would be double counted. Once for the Metropolitan and once for the Hammersmith & City and Circle lines (which are treated as one line for operational purposes and there is a single timetable for both lines). Apologies for that. We are aware that people may had started writing before an edict is made so tend to make some allowance for that. It was a very long comment. All I can say is that if John Bull was serious when he said he might do an article on the subject then that gives potentially gives him some extra material. We can always retrieve your comment so it gets published in a more appropriate place if that happens*. *We wouldn’t normally do this as it is not trivial to do but Mark clearly put a lot of work into his comment. “Metal Mickey” ran on HP1000 real-time minicomputers. If you ever saw the “Windows 3.1” interface it was just a non-safety terminal emulation later which replaced the even older CRT terminals (which still used paper tape for loading timetables!) before them. Are there any plans to upgrade the trackside and train hardware and software on the existing SelTrac lines from the leaky feeder track cable form to the latest radio and beacon version of that technology, as I assume is to be applied by the Four Lines modernisation? The ATP system on the Chilterns network is very closely related to Thales SelTrac CBTC. The antenna cables between the rails are very similar to those on the nearby Jubilee Line with transitions every 25m. They’re not continuous however, only providing ‘infill’ within the nominal sighting distance of the signals they apply to on NR infrastructure. Perhaps it might be possible to modify the Chiltern trains to work under the Four Lines resignalling technology without having to dual fit TPWS/AWS along the shared segments of route. On the outer sections of the Metropolitan Line concerned, a fixed block SelTrac overlay implementation might be perfectly adequate for the traffic levels, perhaps with some local moving block infill for closing up if required at station platforms, which are few and far between on the fast lines anyway. @PoP – Thanks. I also saved the comment in a local text file before posting, which I have learnt to do routinely after bitter experience losing long tracts of online writing here and elsewhere when network/hardware problems occur! The signalling system designer may need to (may already) have in mind what the Chiltern trains running during the relevant future year will be capable of hosting and responding to in terms of clever signalling? There are two magnets. The first is permanent and “arms” the system. The second is an electromagnet of the opposite polarity, energised only if the signal is green (or omitted if a warning is always given at that location). If the second magnet is not detected within a short time, the warning is given. Thus the system is “failsafe” to a degree, since failure of the electromagnet sounds the warning regardless of the signal aspect. Also the magnet does not detect the train, it’s the other way round. Time, distance, train,… how far away are we from an Internet of Things cloud-based solution? Every signal could have a cut-down smartphone talking to some central software in the cloud. Who cares which OS it then uses? Ratty: The serious answer is that whoever has to maintain or fix a system might well care which OS it uses. The fact that equipment using one Operating System may well be able to communicate with equipment using another is a useful development, but it doesn’t invalidate the OS question (which we are still not discussing, though). Using the internet to allow a train to communicate with a signalling centre (for example) may in some circumstances be a viable alternative to dedicated wires or dedicated radio channels. But there are many obvious difficulties, centred on security and reliability. Thanks for pointing that out. I did know that once but had forgotten. I have reworded it. PoP – A suggestion for the article regarding older systems. You mention AWS, which was in principle one of the oldest in-cab signalling enhancements; the GWR ATC and French Crocodile provided similar functionality and date back over a century. Perhaps more relevant to a metro system is the mechanical trainstop however. This was also an early development and although design details vary, most early systems included such a feature, considered necessary due to the terrible potential consequences of any tunnel or elevated line collision. Re the current level of signal failures, I echo MARK TOWNEND’s concern about what the statistics are telling us. I do not for a moment query the thrust of the argument that there are a lot (far too many) but there are no definitions for any of this so-called data. LU used to be good at meaningful stats but less so now. Do we mean any ‘failure’ whether or not it causes a delay? Or any failure of 2-mins or more (the traditional stat)? Does it include points failures? What on earth do we mean by ‘line’ – the line of the maintainer or that of the first train affected or of any train affected? (ie double counting). And so on. My message is no more than to be be very wary indeed about any numbers and seek clarification. They can’t even agree about the number of stations they operate!!!! Or the entire automated task delegated to those distributed modules on the trackside, communicating with each other over a mesh network and the trains in their vicinity. Could be supervised and managed from anywhere with suitable authority and a connection into one of those modules. The trend in modern IT and software architecture is to create components small, discrete and cheap enough that “maintain or fix” is no longer a requirement, because replacement is faster and cheaper. I think this is what Mr Ratty is getting at. IMO It’s not yet quite ready for safety-critical systems, but platforms like Amazon Greengrass are making the concept of an “operating system” something of an irrelevance. I think I see, at least partly, what you are getting at with small discrete cheap components. But I am a bit sceptical. Early transistor radios were made of many small discrete components. Repairing the radios was often a matter of replacing a component (e.g. a resistor). However, the consequence of “many” was that it required much skill and effort to determine which resistor had to be replaced. But yes, if a (modern, replaceable) component is specified only by its behaviour, then what goes on inside it (including which OS runs inside it) is only of interest to its manufacturer, and not to its user. Most modern devices are made of modular, easy to replace components (CPU & memory chips, sensors, etc) or circuit boards. Some are line replaceable, ie swap out a component, or shop replaceable (pull out a unit and replace circuit boards in a shop) to minimise downtime. @Mike Horne – I completely agree. Points failures can mean just that. However, a signal failure often ought to be termed a “signal success” because it is designed to fail safe. In other words, a signal can fail because e.g. a signal lamp has blown or it can succeed in detecting a faulty track circuit, so that is a track failure. For the purposes of the article, I don’t think it matters too much about exactly what the signal failures represent. The important thing is it shows how exact line compares relative to another. And really it doesn’t matter too much how you dice the figures up, they (generally) show the same trend. Clearly, any figures that show failures to the end of December 2018 is going to be partly based on predictions and so there is bound to be an element of error. I took the figures to mean anything that delayed the service and was reported to the public as a signal failure. That would not include track failures but would include pretty much everything else that could be construed as a signal failure. Just about everything will be a right-side failure otherwise one would expect RAIB to be involved. Note, that the scope for ‘signal failure’ is very broad – obviously so because one still gets reported signal failures on lines without signals. An extreme example is a SPAD which, as an old edition of ‘The Tube’ showed, gets reported as a signal failure to the public. One can argue this is correct in the sense that if there were a modern signalling system then this couldn’t happen so should be record as a failure (partly) caused by the signalling system and was avoidable. I believe that the non-safety functions on the Victoria Line signalling was (is ?) running on a special ‘cut down’ version of Windows XP. All the unused components had been removed. There were also problems even at commisioning with laptops that required PCMIA cards (remember those ?) to communicate with the hardware. Commercial electronic products now have a life of under 18 months including the design & sales phases. After that time a newer product supercedes them. If I infer accurately what the LU paper says, I think the District tracks east of Chiswick park will be connected with the Piccadilly so that Piccadilly trains to and from Ealing (and perhaps Rayners Lane) will serve Chiswick Park. Does anybody know for sure what the 4LM programme proposes to install at Acton in near future? Presumably District ATO is expected between Turnham Green and Ealing (or is it?). If so it looks as though it could have a short life if the Picc opts for a different system and it all has to be changed. Acton and Ealing Common by the way are already failure prone so I can’t see signalling being left till 2026 or later. Jettisoning Ealing as a District destination also raises some interesting questions about movements to and from Ealing Common depot. At the moment all movements into the depot are from the Ealing Common end and it is hard to see how else to do it. Track layout-wise, it might even be easier to make Ealing Common Depot a Picc depot and Northfields the District one (with some Picc outstabling!). Northfields was built to District loading gauge. I am not sure I have seen any answers to any of this. One can argue that SPADs on the UndergrounD are not as safety critical as they are on the mainline network because of the way trainstops are deployed. Traditional layouts were always designed to provide a fully braked overlap beyond the signal, proved clear and locked before a train could approach the signal concerned. A tripped train passing a red is designed never to result in a collision. That allows a more aggressive driving style approaching reds which is necessary to achieve the headway required on traditionally signalled tube lines. On the national network, by contrast, extremely cautious approaches to red signals have been encouraged and enforced for decades by operators’ defensive driving policies, mainly because, before TPWS, there were no technical safeguards in place to arrest a train and prevent or at least reduce the energy of a collision following a SPAD. Mainline layouts have overlaps clearly but they are not typically long enough to stop within at the full unrestricted speed possible approaching the signal concerned. Thats why TPWS usually needs an overspeed detector on approach to a signal protecting a conflict, to anticipate a SPAD and start a braking intervention earlier, as well as the trainstop installation at the signal itself. Mike Horne…….in my time, the challenge of stabling at Ealing Common was expected to lead to a higher than usual service to Ealing Broadway at stabling times, It was expected that most trains entering service would enter service down the bank adjacent to the LT Museum Depot. Where is the lovely signalling diagram shown in the photo above the article? Oh, and on the Linux front, TfL certainly have familiarity with it – practically every office desk has a thin client box on it as opposed to a standard PC. And they are all Linux boxes. How will a separate signalling on the Piccadilly work with the tracks shared by District and Metropolitan? Will the Piccdadilly trains be compatible with the new subsurface signalling system or will the common lines have both the old and the new interface between trains and signalling system? This quiestion applies both to when the subsurface signalling will be installed and later when the Piccadilly finally will get new signalling. Even if I could remember the plan, I don’t think you could read too much into it. Circumstances change, technology moves on and the signalling order has not been made yet. There hasn’t even been an Invitation to Tender. Until then, probably around 2020, it isn’t that meaningful to speculate. At the Programmes and Investment Committee we had a good explanation of the signalling rationale. The signalling plan was described as the counterpart to the plan to life-extend the rolling stock on various lines. The intention was to approach the board late in 2019 with a proposal for a signalling replacement for the Piccadilly line. Following a question from a board member about signal failures it was emphasised that the Northern and Jubilee lines would be looked at to try to bring the signal failures down further and to see what other improvements can be made. Interestingly the Victoria line was not mentioned so presumably that is regarded as ‘good as they can get’. Work is underway to deliver the first phase of the programme by the end of June which is earlier than assumed in the Business Plan. This does suggest there may be a few weeks delay. One thing people need to remember is that Industrial users of Windows Operating systems don’t just go to PC world and buy a bunch of PCs to do their work – they buy a specialised ’embed’ form of Windows. The other thing to remember is that safety critical systems are NOT connected to the internet or used to view websites etc. Thus there is no need to ‘update’ the software to cope with viruses or hackers as there is no way for it to get onto the system in the first place. Even if it does then in many cases the effects on the system are neutered by the lack of an data connection to the outside world – IIRC the RN submarine fleet has some sort of computer virus on its missile system that tries to make the user visit a specific webpage but because the software is embed in the guidance system and there is no internet to connect to then the virus doesn’t cause any issues. The SSR signalling is planned to work in two different ways with non-fitted trains. To Wimbledon, Richmond & Ealing the current signalling remains, i.e.no capacity improvement, but overlaid ATO system to allow S stock to ‘read’ signals and run automatically. To Amersham & Uxbridge the current signalling will be replaced with the new ‘moving block’ to allow capacity increase. There will then be some traditional colour light signals added for Chiltern & Picc trains. With extra blue signalling aspects for all ATO trains, with non-ATO trains treating such aspects as danger IIRC. Two things: I’m surprised it’s not been noted that the dates for the first two phases have been put back. The initial phase has been delayed at least a month. Has TFL kept it quiet? As drivers we heard rumours and it was only after a lot of pressure that we got confirmation. Second – as drivers we don’t care about the operating system; what we do care about is that the hardware used for our TCMS screes is so poor – either not enough RAM or very slow processors – that it can take 2 minutes to log in and have a usable screen. The system freezes often – if we want to check the CCTV in the saloon cars during an emergency it can take 10-20 seconds for an image to appear. To me this is indicative of a bad contract: the equipment was specified in the early 2000s but the contracts weren’t written to allow that equipment to be updated as the trains were built in 2008-2010. Circle Line Driver……The S Stock is a legacy of the PPP. Good in some ways….LU got more or less a common sub-surface fleet with air conditioning and bad in others although I wasn’t aware of the limitation you mention. The S stock contract is unusual in that it was placed on Bombardier by Metronet (one of whose shareholders was Bombardier) against a specification written by Bombardier. It was placed in 2003, but design work didn’t actually start until 2005. That said, it used Bombardier’s latest train control computers and software – an upgrade from the 2009 tube stock. The speed and upgradability of control hardware and software is not something any of the industry has yet grasped, not helped by the fact that it’s all proprietary – you have to go back to the OEM. This is true of the Central line trains which have one of the earliest software control systems and LU had to go back to the OEMs for upgrade. Interesting article. Thanks to the commenters who mentioned “Metal Mickey” who featured regularly in debates about delay attribution on the Picc Line. I am bemused as to why a train from Battersea would go to Kennington, go round the loop and then head back to Battersea! (I know the article mentions shuttle working). Is there not an ability to reversibly work each line between Battersea and Kennington if a shuttle is needed? I have a vague memory that Seltrac / CBTC gets very upset if trains move in reverse on running lines so perhaps that prevents reversible working? If the train was trying to reach *Morden* for stabling then yes I can understand the rather involved reversal procedure. Having been involved in many debates about “what is a delay?” and “what is a fault?” I am slightly bemused to see that LU *may* (careful wording) have slipped back from what were pretty clear definitions that applied not so long ago. There was always a lingering concern about delays that were less than 2 mins long as a high volume of such delays could still damage the service. I wonder if the move to very high frequency operation under ATO has triggered a rethink of definitions? WW…….Seltrac is inherently bi-directional. It was the implementation on LU that was not. It wasn’t a Seltrac issue – in fact they could probably run wrong road under signaling control today, they just don’t. 100andthirty: Interesting. The “different values” bit of your comment strikes me as odd, because I understand that a lower limit on a steep downhill grade is fairly common because of braking distances. (Though I suppose that could be implemented as a different kind of constraint from a track-location-specific speed limit). But regardless of all that, proper signage is sure to be an issue, as you say. There is a problem providing an early morning service on the Battersea branch with only three, now two, trains stabling there overnight. The current northbound service starts from Kennington around 5.35 with trains from Morden depot working through. The first southbound train arrives at 6.00 from Edgware to Morden, with the first turning on the loop 5 minutes later. I presume that a shuttle service will fill in until this train can reach Battersea, and provide connections to the early trains. Malcolm…….you are right, and Seltrac can cope with the situation you and I described but by adopting the lower of the two values. If the lower value is in the reverse direction, then performance in the normal direction might be harmed. I won’t be able to continue this aspect of the discussion as I have used up my little knowledge of the no-directional capability of Seltrac. I see that the latest track closure six month lookahead has just two entries explicitly for Paddington – Hammersmith. Both are for the weekend of 23rd/24th June and are for the Circle and Hammersmith & City lines. So I strongly suspect this is the date they are now going for. I also strongly suspect they haven’t yet committed to the second closure (as far as and including Paddington). When it comes to the co-existence of multiple signalling systems, I should point out that in the Wembley/Neasden area there are routes that can handle Met trains using manual signalling, and Jubilee trains using TBTC. Presumably the future replacement of the Met’s manual signalling with CBTC (which I think we can all accept as a newer version of TBTC with a different communication method) will be no more difficult to coordinate. Anonymous…..there are three signalling systems to consider. The depot signalling system controlling movements around this vast depot needs to co-exist with the two Seltrac systems. Each of the three systems – conventional Thales in the depot, loop Seltrac on the Nubiles and Wi-Fi Seltrac on the Metropolitan need to be interfaced with each other to allow reasonably seamless access to and from the depot and allow an increased throughput to get more trains out, mostly from the north end, to populate the service before the morning peak. Even though the two Seltrac systems are similar technology at the interlocking level, they are independent systems and need some clever design to be interfaced. It is not like the interface from one Seltrac area to the next on a self contained line. There’s a crossover at Paddington too, that seems to be missing the article description of the Bakerloo. Bakerloo will no doubt be left to struggle on with existing stock and signalling until the Lewisham extension and new stock in 2028, when new signalling would make a lot of sense. It would also make a lot of sense to re-model the approach to Queen’s Park northbound, so that non-terminating Underground trains can access the current Overground platform. What is also now becoming obvious is the need for the National Rail section of the Bakerloo to be resignalled, with much reduced headways. The forthcoming increase of Overground to 4tph on Euston – Watford service will just about max out the line’s capacity north of Queen’s Park. Only one spare path in regular service pattern. There’s a crossover at Paddington too. Well spotted, Don’t know how I omitted that one but the fact that I believe it is hardly ever used may have something to do with it. Article updated. It would also make a lot of sense to re-model the approach to Queen’s Park northbound… I can see where your thinking lies and from a train planning perspective it might look like a good idea. However, my recollection that the Bakerloo rises sharply at this point and is still in tunnel – it emerges from tunnel only shortly before the station. So probably very hard to do, will cause added maintenance costs and is probably very bad value for money. Remember that people normally suggest solutions to perceived problems that affect them – not the ones that achieve the greatest benefit. Elon Musk is notorious for this. There is a further consideration that I don’t think you have considered. What if a northbound Bakerloo line train is scheduled to go into the London Overground platform and encounters a red signal on the LU/NR border? As I understand your plans, it is now stuck and blocking the entire Bakerloo line. If nothing else, far better to be under LU control than unnecessarily rely on the Network Rail signalman prioritising the Bakerloo train. 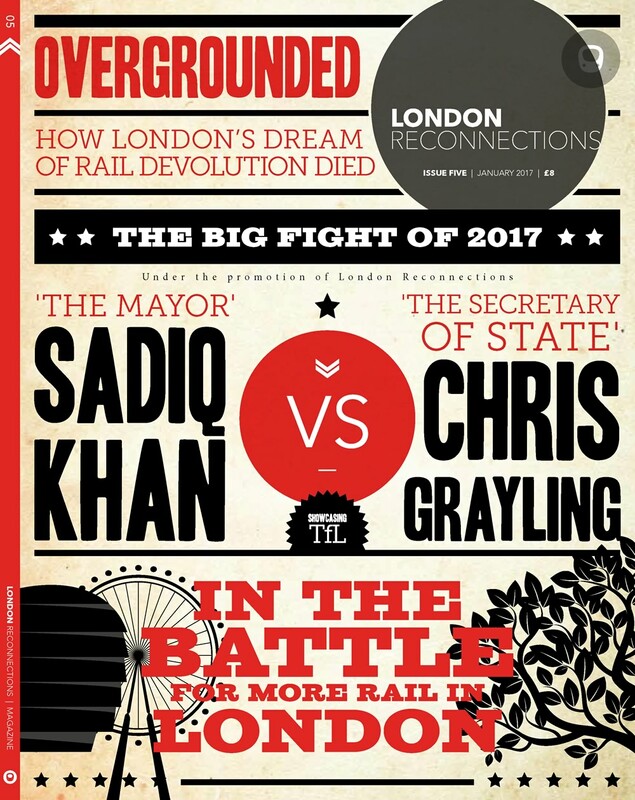 What is also now becoming obvious is the need for the National Rail section of the Bakerloo to be resignalled, with much reduced headways. This has always stuck me as the Achilles Heel of any Underground Signalling plan. For this section London Underground is utterly dependent on Network Rail. Worse still they don’t have exclusive use or nearly exclusive use. So they are largely dependent on Network Rail providing the investment. Even if London Overground could pay for it they will largely reliant on Network Rail’s long term plans and resources. And, of course, Network Rail may well hold off and suggest it would be far better to wait until resignalling the Bakerloo line was imminent. So, resignalling is obviously desirable but I can’t see it happening. If the signalling can’t cope with so many trains I would suggest that much more likely is a reduction of the Bakerloo line service. At least it could be then aligned with London Overground to provide more consistent intervals. The proposed re-arrangement @ Queen’s Park simply won’t (cannot?) work. Look at the Carto Metro plan in detail of the area and you will see why this is so. I have looked at Carto Metro and can’t see why it won’t work – based on that. See here for what I understand scheduler was proposing. It would probably need some very bespoke points as the Bakerloo line ramp down into the tunnel begins pretty much as soon as it passes under the station bridge but there is room, even if no obvious benefit. And besides, why remove the novelty of going through the car shed – I was slightly alarmed/perturbed the first time I went along there! I take half your point. That crossover won’t work, because the tracks are more than a metre different in levels…. THIS aeriel view gives a better picture, perhaps – the two proposed-joined tracks only reach the same level just off the platform-ends where the E car-shed roads lead into the running lines. Also from what I can tell is that the Bakerloo line trains need to drop down to match levels so even less of a problem? This is what the picture seems to show. Last September, I was on a southbound Bakerloo that had to stop there for a few minutes because another train was blocking the platform at Queen’s Park. Needless to say, it was an interesting experience being stuck inside a depot! Having spent a fair few years living near Harrow and Wealdstone station, I have spent plenty of time at Queen’s Park waiting for an elusive through Bakerloo or (shudders inwardly) a Silverlink Metro service so I know it pretty well. I wouldn’t normally encourage comment by reporting day-by-day events but currently the Piccadilly line is completely suspended due to a signal systems failure. Seems that the lack of a signalling replacement is now catching up with a vengeance. I can’t see 2tph TfL Paddington – Heathrow (5 car trains) being much of an alternative. And not a good initial or final impression for visitors using Heathrow. And, if you look at the TfL web-site, the disruption appears to extend to the DIstrict & Circle lines, too. Which brings us back on topic – as I thought their signalling systems were supposed to be almost/completely (?) independant of each other. An informed discussion of what went wrong, as soon as we have more information, might be of some value? @ PoP / Greg – given the cross line disruption I wonder if something is affecting Earls Court? I think the signalling control room is still there. The signalling can’t possibly be independent west of Barons Court given the ability of the Picc to run on the slows and the way in which Acton Town is arranged. It may well get separated at a point in the future but I still wait to see how LU “fixes” (ahem) the issues at Acton Town / Ealing Common. @ PoP – unless LU is going to spend some serious money in the interim (which I doubt) then signalling woes will pull down the Picc Line’s performance for years to come. Worse when they have to start replacing traction power cables and tracks, to allow the new trains to run, due to the risk of disturbance damaging old signalling cables. I know you know this but you can only stretch asset life out so far before you get into serious problems. We had this on the Central Line in the 80s then again with the Northern for years in the 2000s. WW/PoP, as far as I know LU has just commissioned a new signalling control room for the Piccadilly, including the shared Barons Court to Acton Town section at a different location from Earl’s Court. The old control system was “in a poor state” to put it mildly. I am speculating, but perhaps the new system had some teething troubles. I know you know this but you can only stretch asset life out so far before you get into serious problems. Yes, but does Khan know this? And, even if you told him, would he take any notice? It seems that the madness that afflicts London Mayors has already got to him, I’m afraid. Pretty much exactly that according to Mark Wild this morning. Apparently a computer that had been in use less than a week crashed and brought the Piccadilly line service to a halt for about an hour. Whether it was hardware or software wasn’t mentioned. One could question as to why one computer could be allowed to cause such chaos when failing but I guess it is a fairly desperate interim solution until resignalling gets sorted out properly. Strange though, given the almost obsessive amount of testing with ATO from Hammersmith to Latimer Road, that testing (as evidenced by weekend track or even line closures) seems to have been minimal – unless they really thought the likelihood of a problem was really low. Your comment at 08:09 is typical of the rubbish that you seem to write without any apparent awareness of the true situation. If you watch the processing of the latest TfL board meeting you would be well aware of the awareness and concern he has over these issues. And it would not be the first time he has spoken on the subject. I am aware that Mr K may be “aware” – but, by his actions, especially those with a direct financial impact on TfL ( “Fares Freeze” anyone ? ) it would seem or appear that he dosn’t actually care, really. For all of their many faults, both Pink Ken & BoJo managed to keep TfL’s finances relatively straight & healthy. Now, not so much ……..
Ken & BoJo did not have to face falling passenger numbers (and hence revenue). Khan has kept his balances healthy in the sense that the budget get revised and they keep a careful eye on the money. There is no irrational spending. You may not approve of a fares freeze but it is a perfectly rational thing to do with a perfectly valid rationale behind it. The examples you cite have not been delayed or curtailed by the Fares Freeze. We currently do have a dip in passenger numbers, which may, or may not be permanent, or part of a trend, but as DIamond Geezer just reminded us .. but the 2017 total is still 24% higher than ten years ago. – so there, or something. Um…personally I think “BoJo” agreeing that London didn’t need any transport subsidy was an extraordinary thing to agree to. And maybe BoJo committing TfL money (quite improperly) to the Garden Bridge might be another straw in the wind of where there is financial rectitude. And not to mention expensive new buses designed by who again? @AneconSpeak: Of course he would do that, it was expedient for his prospects in Westminster. Since we are talking about trends in passenger numbers, this seems to be as good a place as anywhere to put the March 2018 London workforce jobs numbers, which are just available from ONS / nomis. Percentage changes are from the same month a year before. average annual change 1.9%, total change 2008-2018 20.3% (cf Greg’s figure for passenger numbers). Changes in the last year in construction workforce jobs (less likely to commute and highly volatile 3.1% (over ten years, 2.2%). Changes in Financial and insurance activities workforce jobs, 0.3%; 10 yr average 0.9%. So, average London workforce jobs growth but perhaps some evidence that this is slightly skewed towards jobs that have lower public transport requirements. The ATO/CBTC testing weekend of 23-24 June didn’t go well and no trains entered passenger service. It was abandoned after traffic on Saturday, revision to legacy signalling from Sunday morning and Hammersmith signal cabin was reopened. Further commissioning planned for 21-22 July. A surprise and disappointment given that Mark Wild (and Mike Brown I think) has been at confidently telling various committees that it has all been up and running and working and it would go live by the end of June. It does make you wonder what has happened that wasn’t picked up during those weekends of live running. It is not as if it is a new system though I am aware there are differences between it and the version installed on the Northern and Jubilee lines. It doesn’t bode well for timescales. If it SMA 0.5 goes live at the end of July then it is highly unlikely that SMA 1 goes live before the end of August at the earliest. If they can’t get SMA 2.0 (which includes Baker St) live by the end of November then the December pre-Christmas moratorium on weekend engineering work means it will be after Christmas before SMA 2.0 gets done. So, if that happens, three to four months late* just to get to base 2. * I am well aware that these timetables for implementation are well ahead of contractural dates – but, nevertheless, they are slipping. Quote from the minutes of the Programme and Investment Committee meeting October 2017. Mike Brown MVO also confirmed that he and Mark Wild were focussed on the delivery of the programme and that he had regular meetings with the CEO of Thales to ensure it was incentivised for early delivery. PoP…. Sadly, meetings don’t cause things to be delivered unless either party wasn’t already doing its best, which I am sure they are. Having visited the test site at Old Dalby and the even earlier one at Highgate, I am convinced that they are encountering “emergent properties” of the very complex network\WiFi\RFID tag system that is replacing the vulnerable, but very simple wiggly wire. I doubt that early reports of sending trains without the necessary equipment are more than a minor irritant. It’s likely that SMA0.5 and SMA1 maybe combined for July. SMA2 requires all S8s and a good majority of S7s to be converted, something not achievable by September, so SMA2 is rescheduled for 19/20 January 2019. @DSTOCK7080 [08:53] It was decided on June 23 that SMA 0.5 and 1 would be combined. Having a separate SMA 0.5 was for the benefit of the drivers. I wondered if combining it with SMA1 would be an issue for them, but had not heard that it would be. Testing of SMA 0.5, 1 and 2 undertaken weekend of 21-22 July. First S8 Stock CBTC operation and use of refurbished Swiss Cottage crossover. Due to Notting Hill Carnival no commissioning is planned before, so SMA 0.5 and 1 now 22-23 September. CBTC is Computer Communication Based Train Control. This is a generic term but is also often specifically used to describe Siemens version of this (which I think is actually called Trainguard). The Thales version, as on the Subsurface Railway Northern and Jubilee lines, is branded TBTC which is Transmission Based Train Control and is one offering of CBTC. TBTC, CBTC and ATO (as applied to the Underground) are much the same I think. SMA is Signalling Migration Area. See diagram in the article for where 0.5, 1 and 2 cover. SMA 0.5 is now an irrelevance and has once again become part of SMA 1. CBTC is Communication Based Train Control for the Sub-surface as opposed to TBTC Transmission Based Train Control for the Jubilee and Northern Lines. The difference between TBTC and CBTC is one of perception or branding, nothing more. The Alcatel (now Thales) Seltrac system was originally developed in the mid 1980s using the loops in the track with two way transmition of signals between track and train computers at speeds and frequencies familiar to those used to dial up modems. Its incarnation on the sub surface lines is only different in as much that it transmits between train and track using Wi-Fi frequencies. Both transmit and receive; both use computers so CBTC or TBTC could apply to either system. This is rather like the slightly pointless debates over air cooling, or air conditioning or even full air conditioning! Totally agree with you about there being no meaningful difference between TBTC and CBTC. However, as a result of DStock7080’s comments, I looked up various past TfL Board papers and there does seem to be a consistent approach within TfL to refer to TBTC on the Northern and Jubilee lines and CBTC for the Four Lines Modernisation. So, in future, for consistency, I will try to follow that convention. As a further comment on SMAs (signalling Migration Areas), the critical one to look out for is SMA 6 being completed. Once that is done then all of the Circle line and Hammersmith & City lines will be complete as will all of the Metropolitan line south (or east) of Baker St. This means that there should be no reason why 32tph (or at least 30tph) can’t be achieved in the central area and much of the passenger benefit will have been achieved. Judging purely by weekend line closures, they seem to be pressing ahead at a pace with installing all the trackside stuff so, providing the next migration attempt (for SMA 1) goes ahead successfully, there is no reason to think there is any long term impact on the current implementation issues. Of course, the rest of the Subsurface Railway needs resignalling anyway, the plan is for higher frequencies north of Baker St on the Metropolitan line (so more Metropolitan trains terminating at Baker St) and the system will work better if details of trains approaching the central area are known so the rest of the re-signalling is still important. PoP….point re consistency noted. That said CBTC is probably the most accurate expression for both as it is the computers that are providing the train control and the transmission system is merely the bearer of the commands. The current Victoria line system is also CBTC as it’s computers controlling the where even though it retains fixed block signalling principles rather than moving block. In fact the best generic description for N, J and 4LM is MBTC…..moving block train control. I have never seen this term used! NGH….Even SelTrac isn’t true moving block. It has lots of incredibly short blocks that are 6.25m long. However these are held in a computer’s memory, not physical blocks, and they are small enough that trains move between them very rapidly and for all practical purposes it looks like moving block. I would expect Crossrail’s Trainguard MT to be somewhat similar, but can’t say I know, for sure, or how long their small blocks are! Post SMA 14 work includes final enhancements to off-peak services and possible Night Tube service. “When each SMA is brought into revenue service by implementation of the Railway Configuration State, the full performance of the S Stock train is enabled within the SMA (S Stock performance is de-rated under Tripcock Protection to match legacy stock performance and signalling overlaps). @ DStock7080 – they either have a lot of project float or else these initial delays are going to start affecting the overall project milestones. Unless I have not been paying attention I note that the overall completion date is now 2023 on the relevant TfL project page. Is that a bit later than previously expected? 2022 is when I thought it was due to complete. The first dates I saw after Thales contract sign were in TfL Finance Cttee meet of Jan 2016, giving 90% probable SMA 0.5 in July 2018, and SMA 14 in May 2022. The full peak timetable was for May 2023, with off-peak from Dec 2023. @ Taz – thanks for that. So physical project work, commissioning and handover is due 2022 but LU actually exploiting the system’s capability fully comes in 2023. I know the plan is that some timetable enhancements come in the very early 2020s. The first timetable upgrades are planned in 2021. Each SMA will not be completed until redundant signalling is removed after commissioning. SMA0.5 was first expected for May 2018, but now looks likely in Feb 2019, 9 months later. But seems to be a problem with unreliable communication between trains and track, awaiting a software drop again. Equipment installation and testing is continuing to plan, with SMA3 this weekend around Aldgate triangle. When that is commissioned, will involve all trains and crews on all four lines, and all Circle junctions except the south-west corner! It was listed for Dec 2018 50%, or March 2019 at 90% probable. I can’t understand the timing gaps planned for each stage, but looks like over a year to spare, so could possibly recover to plan by 2020 for the new timetables. The signalling at Kings Cross became a Board issue in January 1930 when a major re-signalling project was approved. Much of the signalling equipment required frequent maintenance due to age. Rather than simply renewing equipment, the decision was made to switch to power signalling using an all-electric system and colour lighting. This would allow two signal boxes to be merged, and the signalling staff to be reduced from 13 men and 4 boys to 8 men and 3 boys. The re-signalling was performed in three stages, as each signal box’s points and signals were converted in turn. The first stage (Belle Isle, north of Gasworks Tunnel) progressed without any hitches, but teething problems with the automated detection systems in the second stage (West Box) delayed the third stage (East Box). But it was all done & a lot faster than currently. The more technology you have the longer it takes to implement but the better the results at the end of it. If you were to show a like-for-like comparison that took longer then I think you would have a point. Also modern methods of working are far safer for the workforce, which often means things take longer. We don’t manage to kill anything like as many working people these days as a result, surely a good thing? Thales plans 14 commissioning stages over almost a four year period to re-signal all four lines. The last re-signalling, between only Stanmore and Aldgate, took 17 years from 1984 to 2001. Excluding a 10 years standstill, this was seven years to achieve 21 commissioning stages. Apropos installing the TBTC system, one recalls the pain of the Jubilee line and the relative success of the Northern line. The 4LM is at least twice as complex as the Northern with added technology complexity of the wireless communication – WiFi, and having to interface with tripcock and TPWS trains. All this has been well well discussed here, but LU’s difficulties should be sending a very powerful message to the main line for when they roll out ETCS on the complicated knitting south of London. c) it’s become a safety-critical item requiring extensive re-testing/re-validation – all taking time and effort. I can envisage a scenario where real life testing of – say – Gunnersbury to Richmond necessitates a significant software change: might that mean all SMAs need to be physically re-tested with all 4 lines shut for a weekend ? Or part closures weekend after weekend until all areas are covered? And wasn’t it originally part of the disastrous PPP project for the tube, involving “Tube Lines” & “Metronet” ???? Peter W/Greg T………The contract was originally let in 2003 with a 2005 start date. It was let by Metronet to Bombardier Transportation Projects, or Bombardier Systems (I forget the exact name) whose role was to deliver systems solutions cor customers. This organisation let contracts to Bombardier UK for the S stock and to Invensys/Westinghouse Signals for the signalling. Invensys were intending to resignal the railway with colour lights and train stops and then overlay with the Victoria line type of ATP/ATO. The trains were designed with this in mind. By 2008, when Metronet failed, the train design was well advanced, but the signalling was behind programme as Invensys were struggling with the Victoria line system. Moreover LU was uncomfortable with having an ATO/ATP overlay on a colour light railway with all the maintenance that was implied. Invensys recognised this and came up with a simpler revised scheme, but it was too late. The failure of Metronet gave LU the opportunity to rescue Metronet without any of its sub-contracts. Though some difficult negotiations, the S stock contract was retained, but the signalling was “left behind” because no immediate prospect of success could be seen given the Victoria line problems. (Victoria line was too far advanced to be left behind). Invensys was retained directly by LU to immunise the sub-surface signalling for S stock. This is what led to the 2011 Bombardier contract and the eventual necessity for three designs for on train signalling on S stock! “Tube Lines” was nothing like as bad as “Metronet”, which might have been suspected to have been put together to get workstreams for its shareholders. None of which saw it as so big and so complicated that it required the very best managers that could be found. The principle, never articulated, that many modern technologies are so robust that the way for the client or customer organisation to get full benefit and good value is to make the manufacturer or builder accept long-term responsibility for maintenance, survives in other contractual forms. “Operational Proving will now be on the weekend of 2/3 March 2019 and SMA 0.5 go live is scheduled for the weekend of 16/17 March 2019. 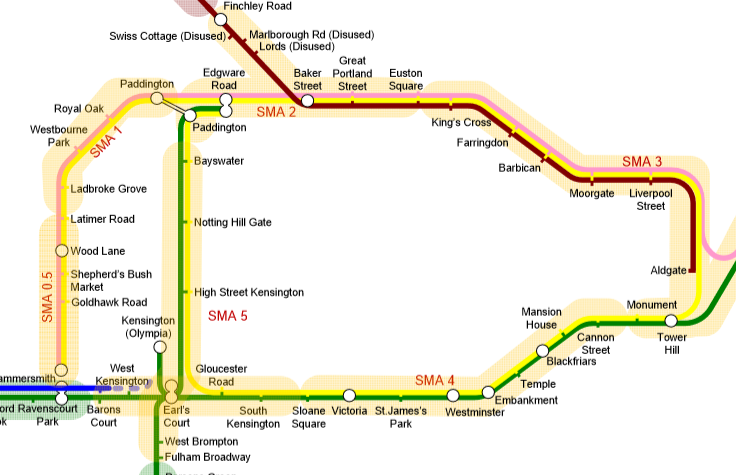 Subsequent SMA dates are to be confirmed once available closure weekends can be identified. SMA 0.5 still down for commissioning 16/17 March 2019. SMA 0.5 CBTC Hammersmith-Latimer Road went live for passenger operation at 14.06 today. I woz there. About to write a quick article with, hopefully, a follow-up article after that. I don’t understand how that link is recursive. This covers much of what I have written with some similar photographs. We are having an awful lot of problems with the latest WordPress software which is more user-friendly to non-technical people but appears to have sabotaged some basic functionality that we currently use. Not 100% sure my article will see the light of day as it may be stale by the time we sort the issues out and others have covered it very comprehensively. So it is just as well Diamond Geezer and others have covered it. Click on the hyperlink “signalling” in the third paragraph of DG’s article, and it brings you back here. Recursive? I suppose my link isnt ‘recursive’ and that is why it hasn’t been mentioned! Cant post a url in case I fall foul of the rules!